If you asked a random person on the street which brand makes the best refrigerators, chances are they would say Sub-Zero. Known for their classic commercial-grade stainless steel exterior, powerful cooling systems, and unmatched reliability, most people would agree that Sub-Zero is the pinnacle of home refrigeration technology. But does Sub-Zero have a freestanding refrigerator in their product line? Indeed they do, and they certainly didn’t disappoint! Many customers have asked us, “Does Sub-Zero have a freestanding refrigerator?” As it turns out, they do, and it just so happens to be one of the most brilliantly engineered, stunningly beautiful models on the market today. Meet the Sub-Zero Pro 48 refrigerator! 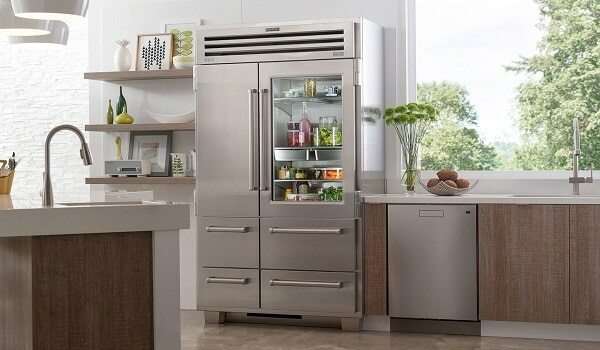 This Sub-Zero freestanding refrigerator is the biggest, most powerful model of its type in production. They’ve poured all of their best technology, designs, and features from decades of Sub-Zero engineering into one killer unit that’s sure to impress even the staunchest critic. For a brand that’s already known for storage capacity, this Sub-Zero freestanding refrigerator is unbelievably spacious. 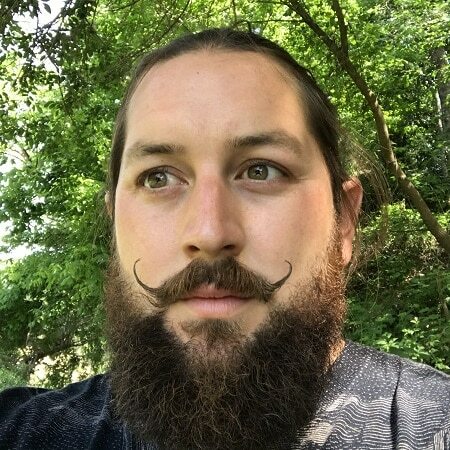 At 18.5 cu. ft. of refrigerator capacity and 11.7 cu. 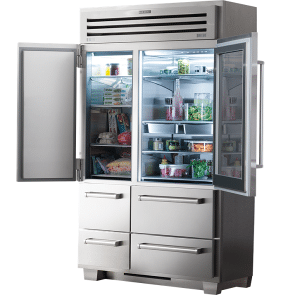 ft. of freezer storage space, the Pro 48 is the roomiest refrigerator Sub-Zero makes. Today’s refrigeration design is all about storage options and flexibility, and Sub-Zero gives you no shortage of choices. All of the Pro 48’s shelves are adjustable, and interior drawer dividers can be used in any drawer for maximum customization. Check to see if you’re out of milk quickly with the Pro 48’s clear-view glass door option. This triple-pane, UV-resistant glass door converts your Sub-Zero unit into a beautifully-lit display case. Never wonder if your refrigerator or freezer is cold enough again thanks to this easy-to-read external refrigerator temperature display. The only problem with getting the very best is paying for the very best. 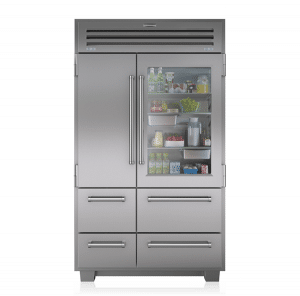 The Sub-Zero Pro 48 freestanding refrigerator has an MSRP or $16,950, which is a bit more than their built-in and integrated models. What you get though is unrivaled beauty and quality that will last a lifetime. 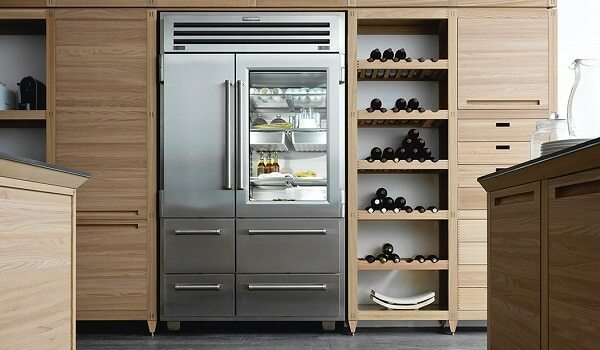 The next time someone asks you, “Does Sub-Zero have a freestanding refrigerator?” you’ll be able to tell them all about the world-class Pro 48 model. Or, hopefully, you’ll be able to show them yours! If for some reason your Sub-Zero refrigerator needs appliance repair Irvine CA service, be sure to call the experts at Caesar’s Appliance Service.